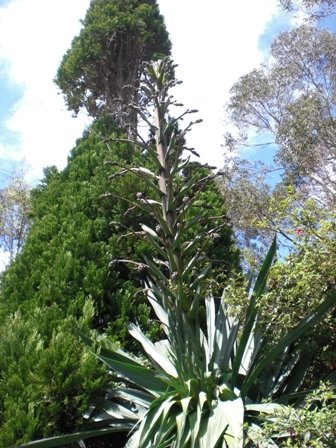 The Furcraea longaeva is a succulent related to Agave and is known in its native Mexico for having a very tall flowering inflorescence – upwards of 12 metres (40 feet)! We have a number of Furcraea at Earlscliffe. 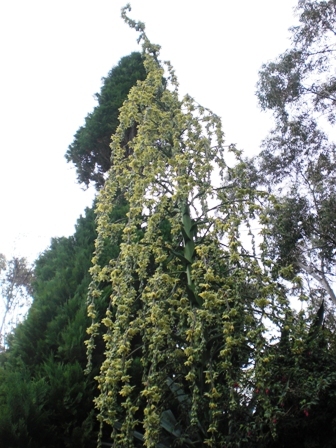 The tallest (and oldest) is about two metres high and has been planted at Earlscliffe for about fifteen years. 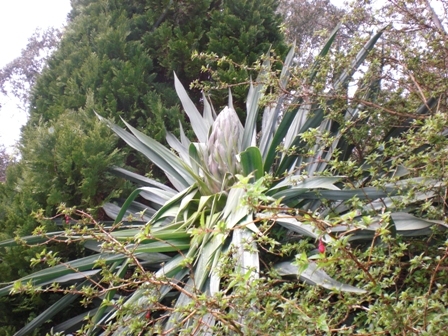 In April 2009 it started to flower. 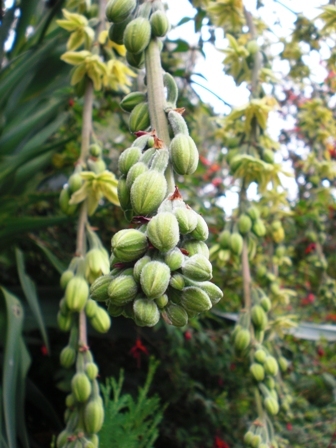 It has flowered in many places outside of its native country. 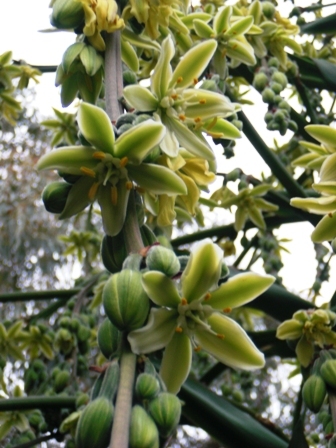 A web search shows that it flowered at RHS Wisley, Surrey, England in 2004, and in North Devon, SW England in 2006 and at the Abbey Gardens on Tresco, Isles of Scilly. However, we are uncertain it has flowered so far north (53.3º) before! 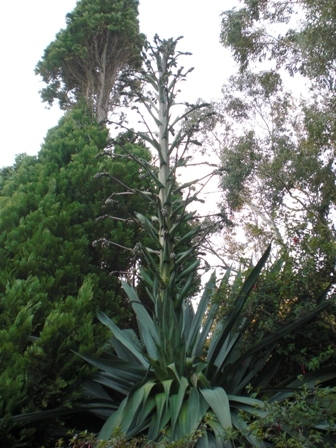 We will continue to photograph it regularly to show how tall the flowering spike grows. Of course, it won't reach 12 metres! However, at its fastest it was growing at a rate of over 12cm (over 4.5 inches) per day! 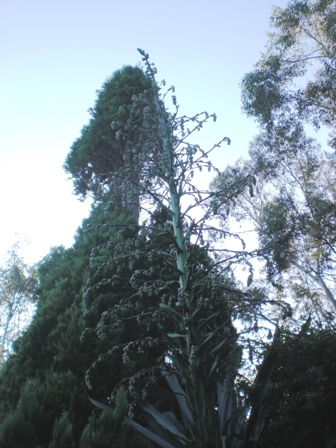 It now stands at around 6.36 metres tall (nearly 21 feet) and the growth has slowed right down to only 1.43cm (just over half an inch) daily. ¹. 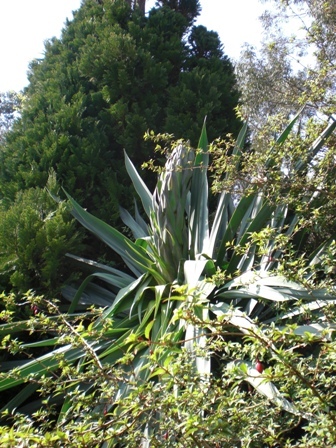 The Furcraea was planted around 1994 by David Robinson who identified it as F. longaeva. 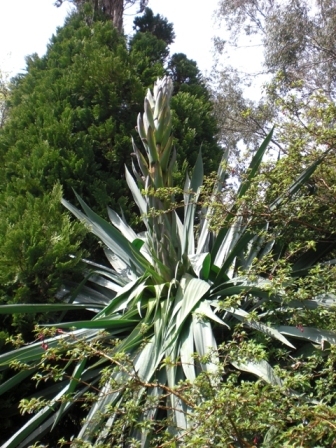 However, there has been a lot of debate about whether the plants sold as F. longaeva are in fact F. parmentieri (see the RHS Advisory Panel on Nomenclature & Taxonomy – 21 January 2008). Picture taken 13th April 2009. 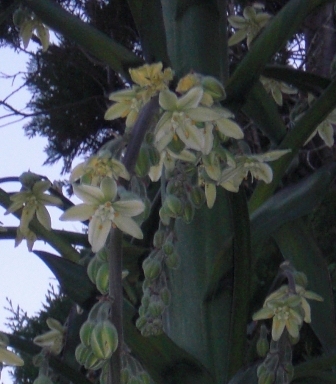 The plant itself is over two metres tall and the flower is about 30cm. 27th April 2009. 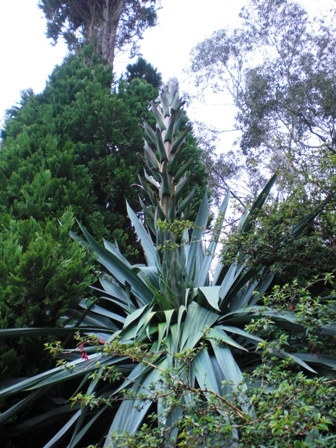 Now the spike is around 2m tall, doubling the size of the whole plant. 2nd May 2009. 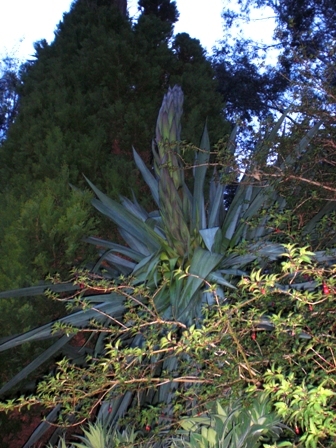 The plant growth seems to have slowed down with the spike at around 2.4m tall. It is now opening up more. 9th May 2009. The plant has grown further and is starting to outwards. 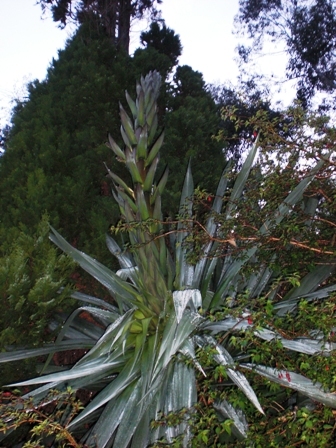 The spike is around 3m tall with the overall plant now standing 5m high. 12th May 2009. 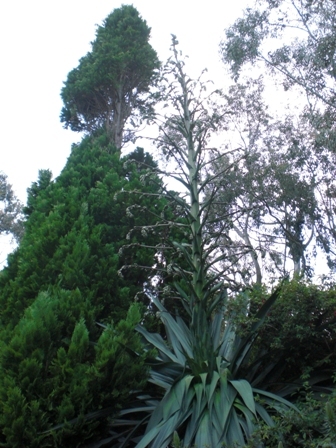 The spike is now around 3.25m tall, making the whole plant 5.25m. The pole I have been using to measure the spike is about 4 metres long, so I haven't much left to hold on to! 22nd May 2009. 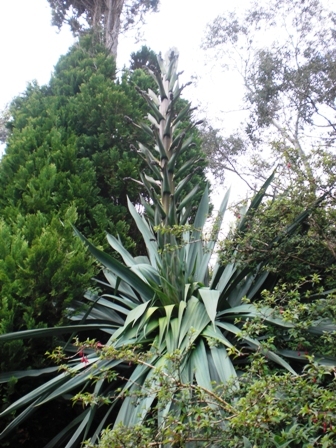 The spike has grown again and is now around 3.7m tall, making the whole plant 5.7m. I have now attached a length of wood to the original pole to help measure the plant! 30th May 2009. A bit more growth. Now the spike is 4m tall, making the plant 6m in total. Think I need a longer pole! 9th June 2009. A little more growth. 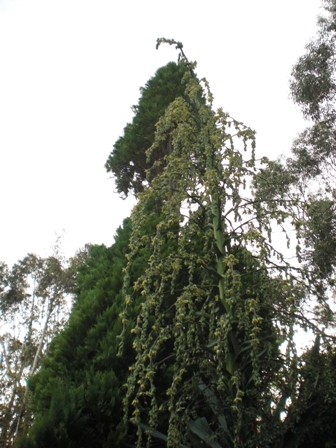 The spike is now 4.26m tall, making the total height of the plant 6.26m. The growth has finally slowed down and is only about an inch a day (2.6cm) (thank goodness as my measuring 'stick' is almost at its limit). 9th June 2009 continued. 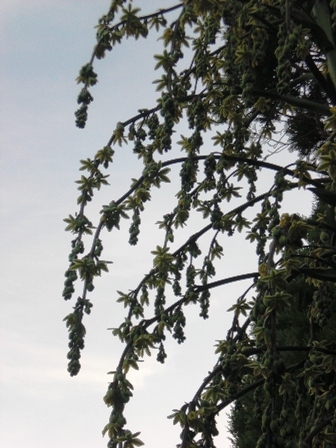 The drooping inflorescences are where the main activity is happening. 9th June 2009 continued. The individual flowers are starting to appear and the whole plant is starting to take on a more pleasant shape. 16th June 2009. Slowed right own now (thank goodness as I had to get rid of my pole and now have three long bamboos taped together to measure it). The spike is 4.36m with the total plant being 6.36m. It is now at about 1/2 and inch a day (1.43cm). 16th June continued. 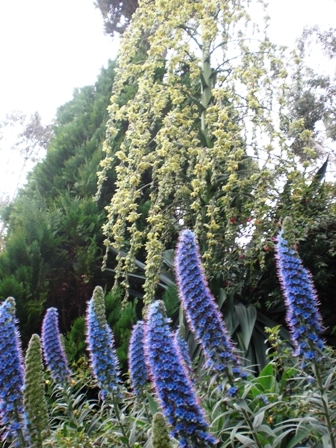 The plant has a flourish of echium candicans at its base. 16th June continued...with many more flowers to come.